Sounds like it’s going to be a great show at ARBS this year, one you definitely don’t want to miss out on! 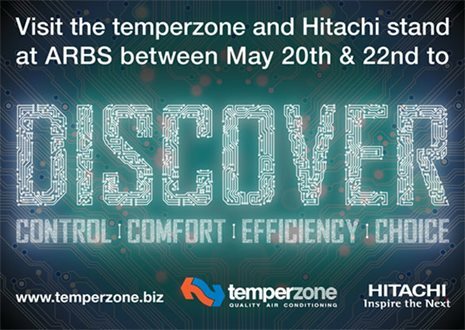 Visit the Temperzone and Hitachi stand at ARBS between May 20 to 22nd to Discover Control, Comfort, Efficiency and Choice. We will have plenty of things to show you including an OPA296 Rooftop Package Unit. You can find us at stand 412, so please come and enjoy a coffee and bite to eat. It’s a great time to talk to our sales engineers about your next project. The future of Rooftop Package units is here. Temperzone’s next generation OPA296 is a high performance unit which provides close temperature control and greater efficiency at varying conditions. Temperzone produce a range of Rooftop Package Units that are designed to meet a wide range of application needs from project or building type to specific project or equipment requirements. Temperzone are proud to launch the new Hitachi Samurai RCME-AH Modular Screw Chillers at ARBS. Hitachi Chillers have earned a worldwide reputation for quality, efficiency and extremely good reliability. Over the last 3 years Hitachi VRF has established itself as a premium player in the Australian VRF market with hundreds of projects completed. The Next Generation FSXN1 Hitachi VRF will be released in Australia in early June.